You may ask the question: Why would I pick to ride from Darwin to Broome? The answer to this is that I had originally thought about riding from Nepal to Kathmandu which was basically like riding across the top of the world. Then I thought about how beautiful Australia was and I came up with the idea of riding across the top of Australia. I decided to avoid Kakadu (too many crocs for this old man!) so I chose the route of Darwin to Broome and the D2B was born in February 2014. The planning then began and has been the most time consuming component of this adventure. So much research and detail has gone into my decisions and day to day itinerary. I have listed a few of the main question and answers below that will outline the planning process and the research behind the D2B. How many days will I be able to do it in? The first thing I had to consider was how many days could I take off work! I had 26 days of Annual Leave which meant that I allowed myself 2 days to travel to Darwin and get prepared and then 3 days in Broome to recover (and sightsee) which left me 21 days to ride. How far can I ride every day? This really ties into the next question of where I would be staying every night. I have 4-5 rest days which has left me with 16 riding days of approx 118km a day. From this average I worked out how far I would be going each day depending on the best and safest accommodation for the night. Click the link and check out my itinerary. Where do I stay at the end of each day? I touched on this in the above question. My decision was based on the 3 major towns between Darwin and Broome (Katherine, Kununurra & Derby) which will be 3 of my rest days. The other 2 days are Ellenbrae and Silent Grove where there are some great tourist attractions I want to visit (while resting). All the other nights I will be staying either on the side of the road or caravan parks along the way. I will be carrying overnight equipment with me for camping on the side of the road and I am sure that I will be looking forward to the luxurious amenities (shower) of the caravan parks. How do I carry enough food and water? This was the most important part of the planning process. I have to be extremely careful that I carry enough food to fuel my body for the distances that I will ride and enough water so that I do not get dehydrated at any point. In the planning of where to stay there was an 8 day period where I will only come across one roadhouse. This was the point that I started to investigate trailers that would give me the ability to carry not only my camping equipment needed but also enough water and food. I basically read blogs from other riders across the world and I came to the conclusion that I needed a single wheel bike trailer. I bought a DOM T2. (Photos in the Gallery). 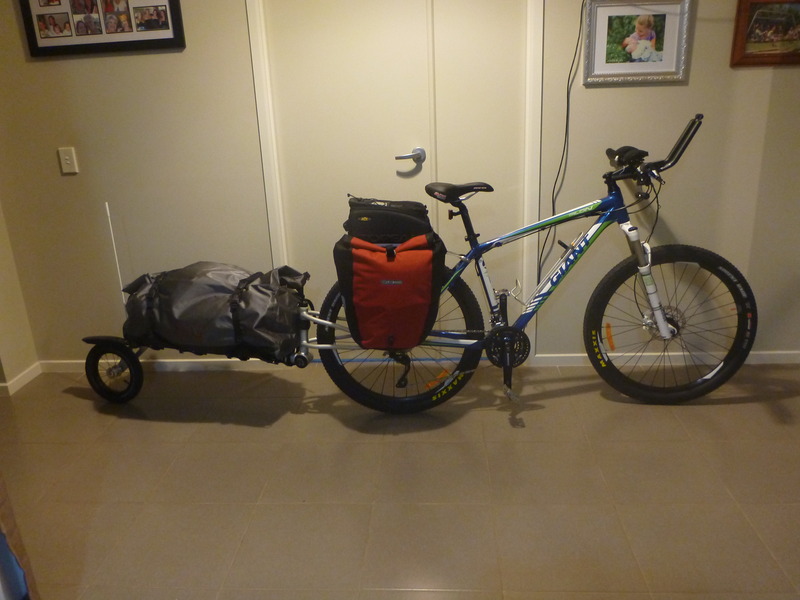 Having the trailer I can now carry an extra 30kg for the ride. What safety measures can I take for the ride? To be honest with you I did not consider taking any safety measures and I aimed to have a leisurely 21 day ride. My daughter Emily rejected this and the rest of the family were on the same page. I started looking into different things that I could take to be SAFE (family are now happy). I bought a SPOT. It is a personal GPS device that you register online and will give me access to any of the emergency services if help in needed. It also gives my Family access to follow me during the trip on Google Earth Maps. My son in Law is a Paramedic. We have worked on my first aid skills, especially the 4 B’s (Burns, Breaks, Bites and Bleeds). He has also put together a first aid kit that is specialised for the trip with everything I need without too much weight (thanks Ryan). How do I keep the batteries of my essential equipment charged? This Solar Panel charges a back up battery in the kit and also charges anything that I attach to it during the day while the sun is out. At night I can then plug in all my batteries (Go Pro, Camera, Phone etc) with the Battery and the cycle continues. This is a good question for Me and Alanna……. Lucky she is here helping with the Blog. I will be carrying my mobile and Service Pro 3 with me however I will only be checking in on the 3 major towns where I will have internet access. The aim is to forward through some photos and a quick summary of how it is all going and Alanna will load it up for me on the Blog site. Although I am on the road I would love for you all to still comment and chat on the Blog site and please still send any questions through to my contact page. Pam and Emily will be checking in regularly to allow comments and I will love catching up on my rest days. How do I make sure that my bike and equipment are suited to last the distance? Now this is the MOST important component of my planning. I stood in my garage and looked at my racing mountain bike one afternoon and thought “you poor old thing” (she is 8 years old and she has done over 10 000km) and I came to the conclusion that I would invest in a new bike for the trip. I looked at some of the new GIANT racing mountain bikes and noticed that they are not really built for touring. For example there was no threaded area to bolt a rear carrier on for the Panniers and MTB racers were rather expensive. With the help of John and Yvonne at Camden Discount Cycles I decided on a GIANT TALON 27.5 which John and his team rebuilt with added features to suit the conditions. They put wider handlebars for more real estate (room for GO PRO, Cameras etc), added the rear carrier equipment and they added double thick spokes on the rear wheel and “The Northern Express” was born. Thanks to John, Yvonne and the team I am now comfortable with my bike and trailer and the adventure will soon begin. Check out some of the great sites and information I found while researching the ride.